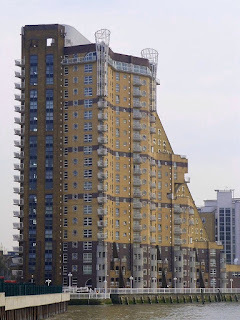 This is one of a set of walks in the Isle of Dogs. Beginning from Island Gardens DLR. 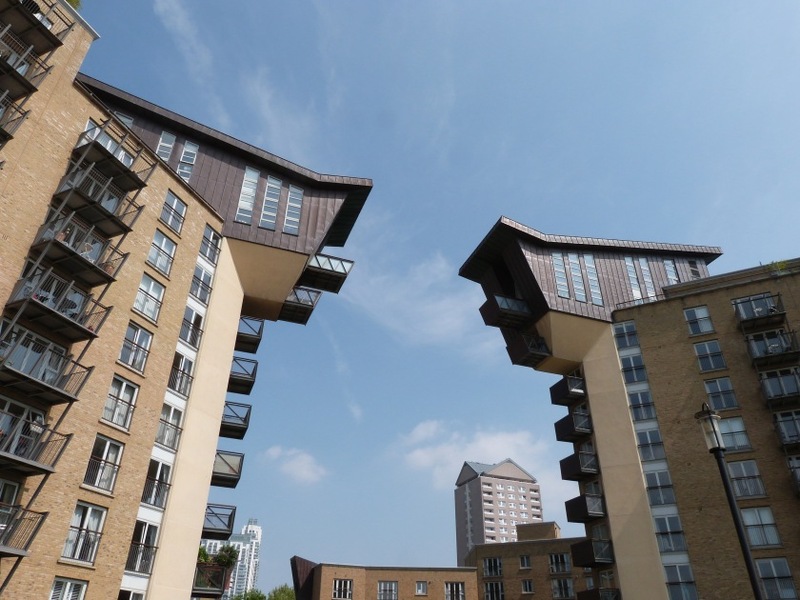 The route follows the Thames Path, passing the launching site of Brunel’s Great Eastern and lots of exciting modern architecture. 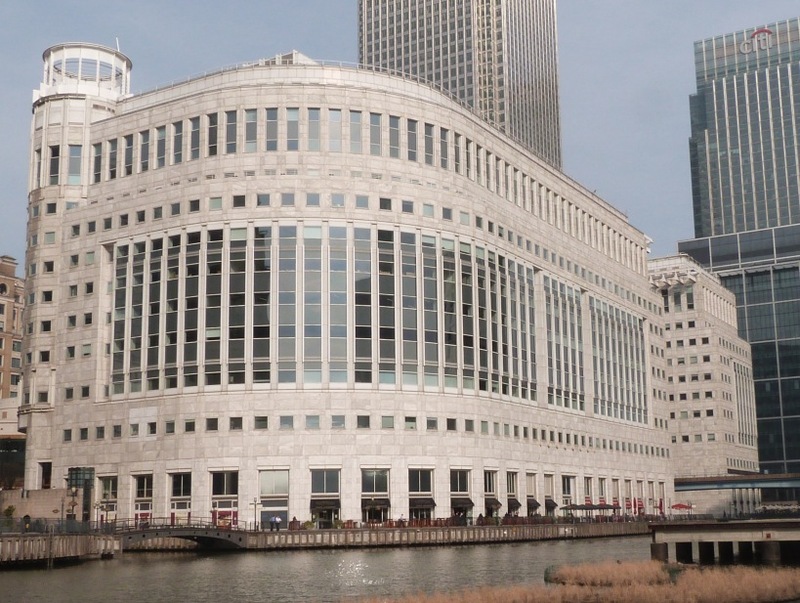 It ends at Herons Quays DLR in the heart of the Canary Wharf business centre. On leaving the station cross Manchester Road and then go down Douglas Path to Saunders Ness Road. Turn right and go to the slipway next to the rowing club on the corner of Ferry Street. From here there is a superb view across the Thames. The newly-restored Cutty Sark is on the right (west), to the east is the Trafalgar Tavern. A little further on are Trinity Almshouses, dwarfed by the London Transport power station. For full details of all these go to the Greenwich entry. 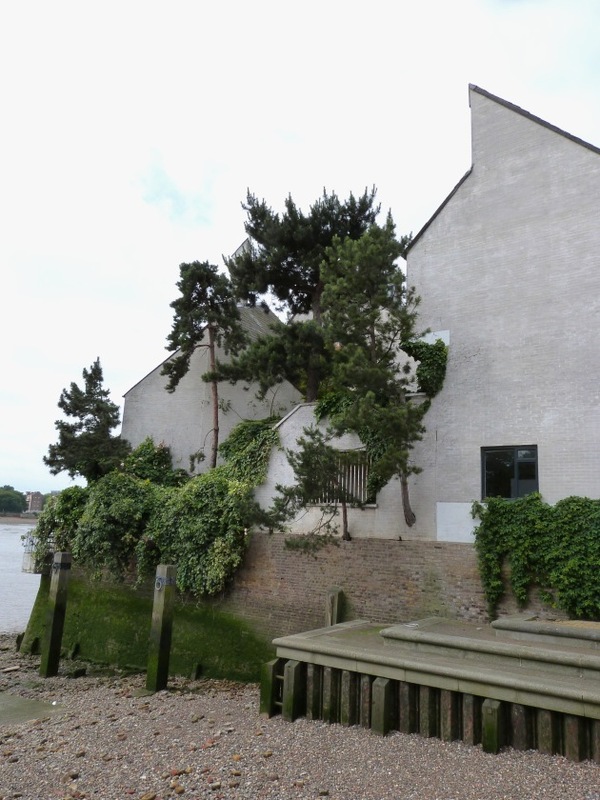 Near where you are standing is a strange building with pine trees growing out of the wall that forms part of the dock. This wall is also part of a house - a somewhat eccentric building with a sail-like roof outline. At the top of the slipway, are more houses which incorporate an old building, once part of a paint factory. Walk left, following a sign to the Pier. When you arrive at a gap between Midland Place and Livingstone Place go through it to get to the riverside. You have to return to Ferry Street after a few metres (via Felstead Wharf). At the beginning of East Ferry Road is The Ferry House pub, which proudly announces that it is ‘The Oldest Pub on the Island – Circa 1722’. It was used as a look-out and waiting place for those wishing to use the ferry. The ancient river crossing it used to serve, once reached by a road through the marshes, became redundant with the opening of the Woolwich Foot Tunnel in 1905. If you would like to see another small area of original docklands, wander a little way up East Ferry Road to Westferry Road/Manchester Road. Here you will find the old Fire Station (1905) - now a restaurant, the Lord Nelson Pub (1855) and a few cottages. Walk back and go through the iron gates* next to The Ferry House. Turn left, and go through a car park towards the river. Turn right, walking by the gardens of St. David’s Square. Now the path broadens out and is lined with trees. 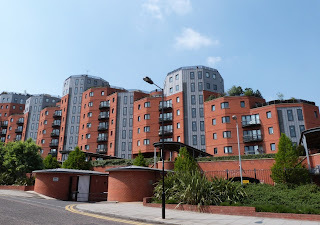 After several apartment blocks (possibly too many white painted bits and pieces) and a more austere red brick development you will come to something quite different. The low white-brick houses with substantial wooden balconies are unusual in that they are ‘self-build’. Full details of this scheme and other modern architecture in the Island can be found in the link at the end of this entry. 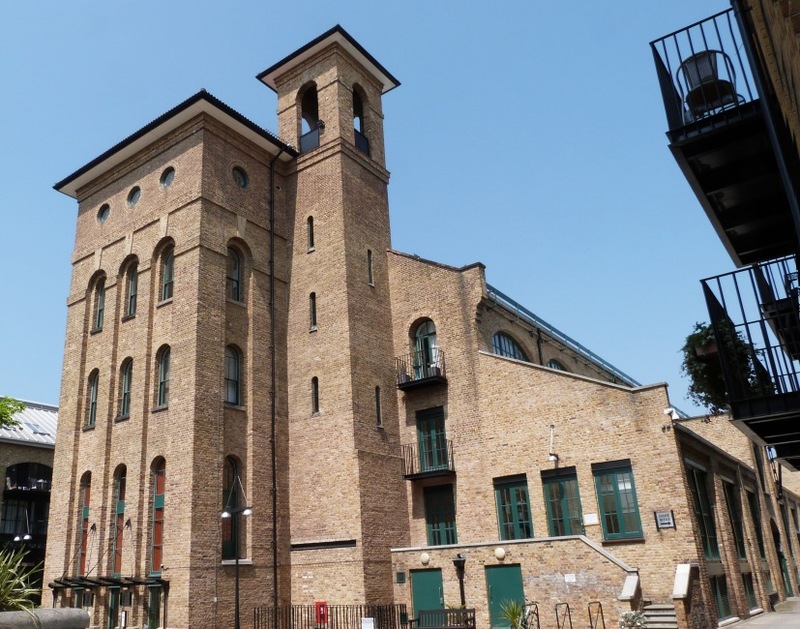 Next comes an area of great interest to industrial historians - Burrells Wharf, once the centre of Millwall Iron Works. The tall building in the centre (the Plate House) was erected in 1854 by master builder William Cubitt. 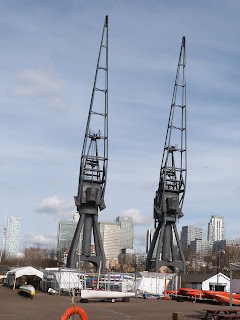 It is thought to have been constructed to house the travelling cranes for use during the manufacture of the massive 40-foot paddles for the Great Eastern, Isambard Kingdom Brunel’s famous steamship intended to carry 4000 passengers. At the time the Great Eastern was the largest vessel ever to have been built and was a source of fascination for the general public. Unfortunately, Brunel had accepted a too-low estimate of naval engineer Jack Scott Russell, who, although a brilliant scientist, was less than realistic when it came to accounting. This meant that his partner was constantly trying to sort out the finances as well as keeping an eye on the progress of the ship. In view of her size (nearly 700 metres long) it is not surprising that the Great Eastern’s launch was fraught with difficulty. Having been built sideways on to the river, she then had to be dragged into the high tide sideways. As predicted by her designer, the giant vessel proved too heavy for the available equipment, and it was not until three months later, at the end of January 1858, that the launch finally succeeded. 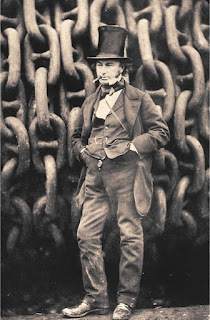 Brunel’s troubles did not end there, for during sea trials the following year there was an explosion on the ship which killed five men and injured several others. Already a sick man, this episode probably worsened his condition and he died shortly afterwards. To complete the sorry story, Jack Russell was declared bankrupt and eventually suffered a nervous breakdown. The ship didn't fare much better - details of her mixed career can be read here. The Plate House has been converted into flats, but its importance in marine history has been recognised by leaving many of the original features. To explore more of Burrell’s Wharf, walk down the left hand side of the Plate House and turn left again into a cobbled way between Taffrail House and Slipway House. Return to the front of the Plate House and make your way down the east side, past Beacon House, to an alleyway for an exit through a stone archway to Westferry Road. Immediately to your right is Scott Russell’s Counting House - the scene of many an argument. Turn around and look across the road to The Forge. Now an up-market craft centre, it was built in 1860 for the firm who took over the site after the collapse of Scott Russell’s firm. Inside the forge six steam hammers banged away noisily, creating parts for an armour-plated warship, HMS Northumberland, launched in 1866 – another difficult and costly enterprise which resulted in the iron works closing down. After this, the Thames-side ship-building industry began to decline, and in 1888 the site was taken over by Burrell & Co, paint and colour manufacturers. It has gone down in local history as being the place where you could see pink pigeons, their feathers dyed by the emissions from the factory. Paint production ceased there in the 1980’s. 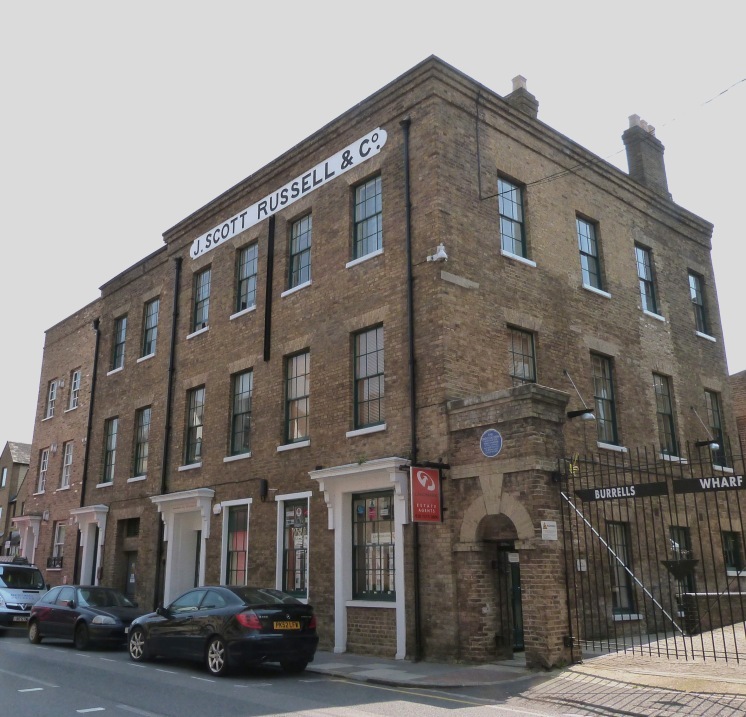 After having explored this historical area continue walking up Westferry Road until you get to a crossroads. Look to the right, up Harbinger Road, to see some nineteenth-century dockers' cottages. On your left is Napier Avenue. You will see a grassy area ahead - a reminder that while heavy industry was being carried on here, not far inland large tracts of pasture remained. If you walk towards the railings you will see the remnants of the slipway where the Great Eastern was launched. Just a collection of ancient beams on a concrete base – but what a tale they tell! 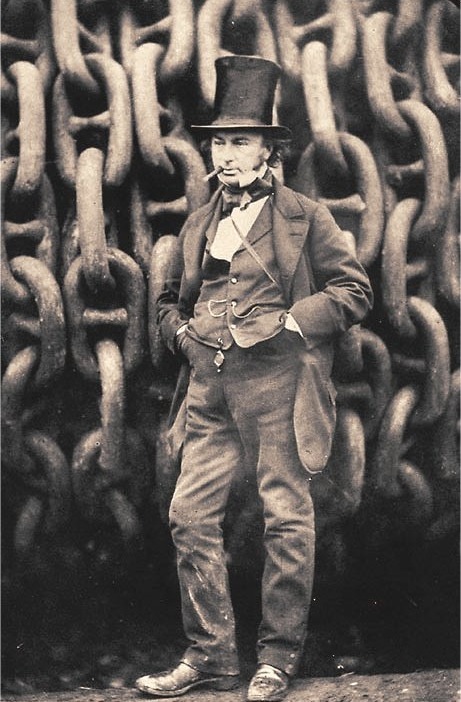 Wander round to the riverside to see a length of heavy chain lying on the path, similar to that seen in the iconic picture of Brunel at the launch of the Great Eastern. At low tide the ghostly remains of further beams can still be seen on the foreshore – damaged by the V1 rocket that landed on them in WW2. The Google satellite view shows the site very clearly. Full details of the slipway can be found in the report of the archaelogical investigation undertaken in 2010. Masthouse Terrace Pier shown cutting through the centre of the slipway is a stop for Thames Clippers. Continue by the river until the Thames Path signs indicate a way through Ferguson Close and Mast House Terrace to Westferry Road. At this point the route is inland for about ten minutes. Soon you will see St. Edmunds RC church on the other side of the road. Built in 2000, its simple, clean lines make it surprisingly effective for a comparatively humble piece of architecture. Next comes ‘‘The Space’ Arts Centre, an ex Presbyterian Church (1859) in Romanesque style. It has had a varied life, since before becoming a place for the performing arts it was used for repairing cranes. By now you will have become aware that this is the less glamorous side of the island (unusual in that it is usually the eastern parts of an area that are unfashionable). Cross Claude Street and Crews Street. 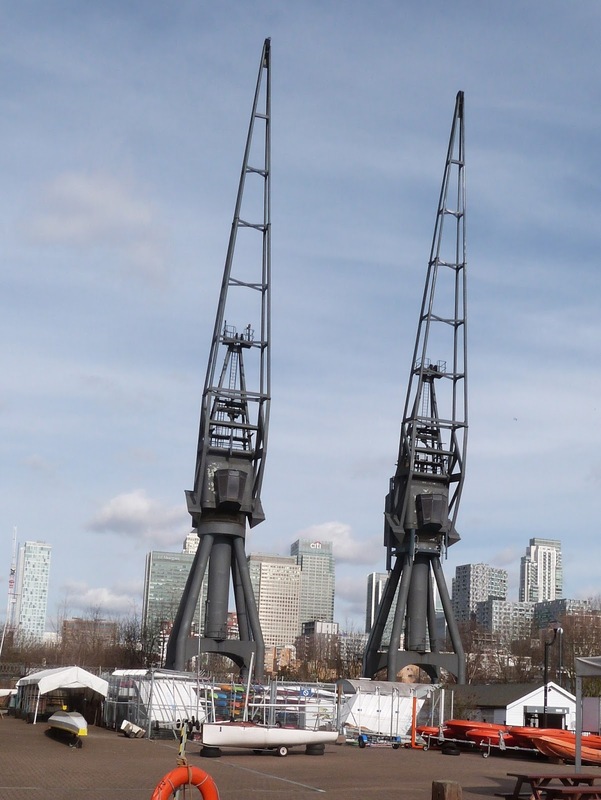 The road rises and you will see a couple of old cranes that mark the end of Millwall Outer Dock where the Docklands Sailing and Water Sports Centre now has its home. On the right, just before the enclosed area, is Dockers Tanner Road. An explanation of the name and account of the London Dock Strike of 1889 can be found here. Ahead you will see the striking grey and orange blocks of New Atlas Wharf. On the left are the remains of the lock for Millwall Outer Dock. The piece of machinery lying beside it is a hydraulic jigger, part of the mechanism that once operated the gates. In WW2 the lock was bombed and never re-opened. This all seems a bit sad, since the high tide reaches far up the long slope, as if trying to find the lock it once filled. This now looks resembles a car park - but you will see from the lines of tidal rubbish it would be foolish to leave a vehicle there! 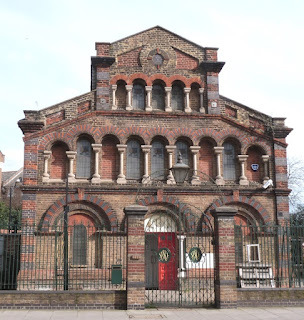 Wander back to Westferry Road and continue as far as Arnhem Place where there is a Primary School. This is an interesting building with a 'green' wall and beautifully designed sweeping roof, visible once you have gone down Arnhem Place to return to the Thames. From the river esplanade there is a distant view of the Shard: on a grey day its ’broken’ summit disappears into the clouds as the architect, Renzo Piano, intended. Go right, to John MacDougall’s gardens, laid out in 1968, the only such green amenity on the Island when the docks were working. Named after a member of the famous flour milling family who once owned a factory on the site, this small park was re-vamped in the 1980's. It's cleverly laid out to provide something for everyone. A little further on is the old West India Dock Pier at Limehouse Reach, now the haunt of cormorants. 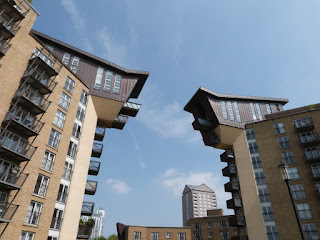 After a stretch of somewhat undistinguished buildings, Millennium Wharf shocks with its brutal cantilevered penthouses thrusting out towards each other like angry cranes. The rest of the tall blocks also mirror dockside machinery, with metal balconies set at an angle. Exciting rather than beautiful. Next comes something much more graceful, the Cascades development. It's worth taking a bit of time to look at these cleverly-designed apartments that have lots of references to marine themes - there's a particularly good view from the west side of Limehouse Dock. To get to this follow the Thames Path as it curves and goes down to the remains of the lock that was once the entrance to the West India South Dock, which was built in the late 1860's. 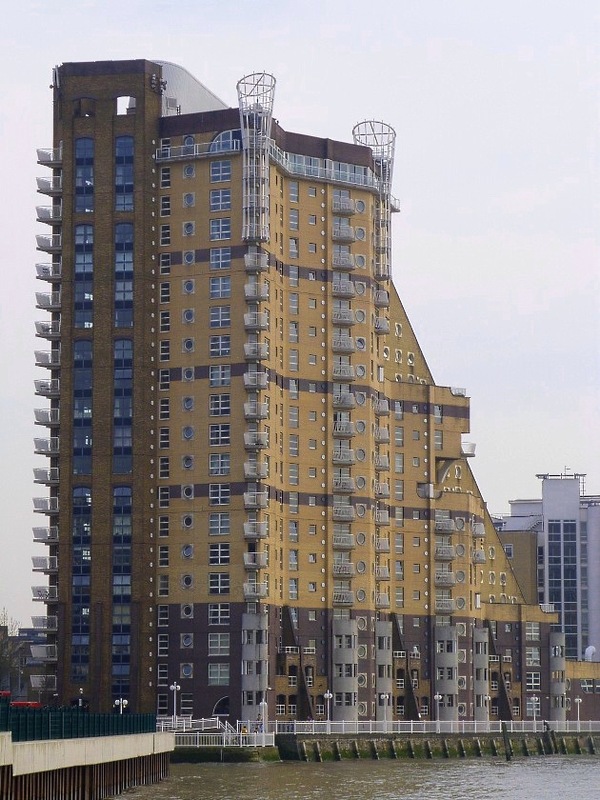 It was created from the City Canal (1805) that cut straight right across the Isle of Dogs. The idea was to save the awkward journey round the Island, but it was a commercial failure, largely owing to the fact that the effect of the tides seems to have been underestimated. Incidentally, the canal made the peninsula a real island until in 1930 the western entrance, unused for decades, was finally filled in following the rebuilding of the Blackwall tidal lock to the east. 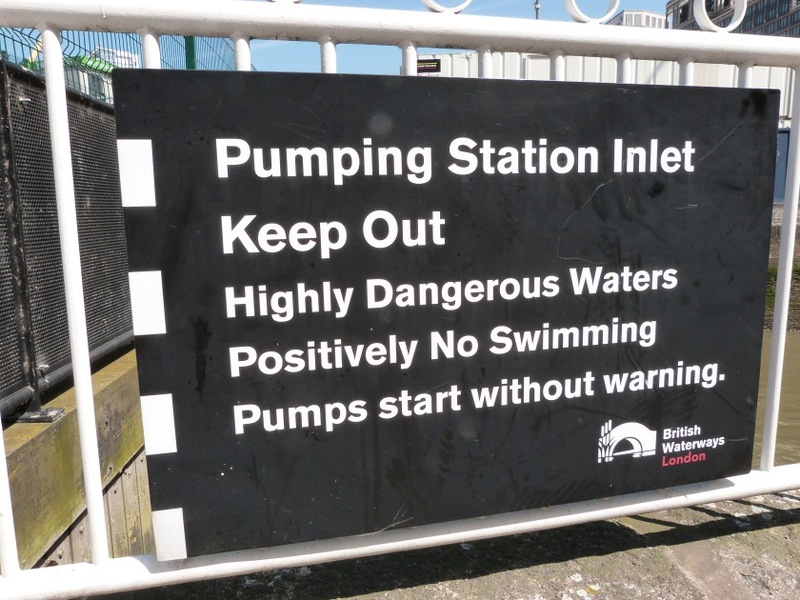 Nowadays the inlet is part of an impounding station, built in 1929 to regulate the level of water in the docks. 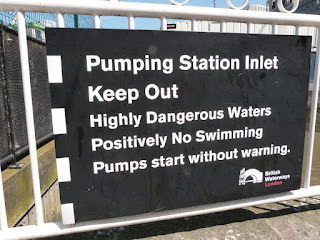 By the side of the pool there is a stern 'no swimming' warning, and indeed while I was there one of the pumps started working - the whirlpool effect was distinctly scary. 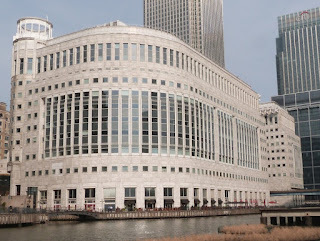 Having not gone swimming, take the left turn over the water and cross Westferry Road at the lights. Follow the path as it bends to the right, passing the Pumping Station (note the Port of London insignia on the end of the building) You are now in Marsh Wall. 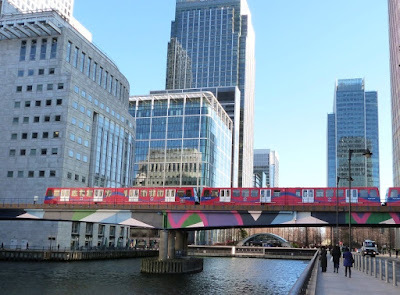 There are extensive building works in this area, so please be careful as you cross over to make your way left towards Heron Quays DLR and the main business centre via a temporary fenced in walk-way on the right. The curved building on the left (reflected in the photo) is a respite from the uncompromising straight lines of so many of the towers. Ahead you may see a couple of trains passing over the railway bridge - an entertaining sight as they suddenly appear and disappear between the office blocks that book-end the line. If you wish to explore the Canary Wharf area, click here for a separate route. * If the gates by the pub are closed, walk up East Ferry Road, left down Westferry Road, and turn left through the gardens of St. David’s Square .Go to the left again past a rather grand flight of step to find a slope that leads back to the river. **In some guides you may see a reference to a ‘Traffic Light Tree’ on the roundabout. Sadly, this has been removed owing to major roadworks. Hopefully it will reappear somwhere else, as it is safely in storage. Google Streetview also cannot keep up with the rapid changes in the area, so don’t be surprised if you come across differences when you are actually at the location.